The topic of parasites is included in this web site because it is commonly recognized (at least in the alternative medical community) that intestinal "dysbiosis" frequently is accompanied by, or caused by, infestation with intestinal parasites. "Dysbiosis" refers to a disorder of the natural biological state of the intestines, such as a Candida or other fungus or yeast overgrowth, or the presence of pathogenic bacteria or parasites. Candida overgrowth is a major topic of this web site. The experience as recounted by very many healthcare professionals in Internet resources, as well as the personal experiences of Candida sufferers, is that Candida overgrowths are commonly accompanied by both pathogenic bacteria and parasites. The yeast forms a coating on the mucosal lining of the intestines, and that lining provides protective cover for the growth of these other undesirable agents. Separately from Candida, there are numerous credible sources suggesting that even in developed countries a very large percentage of the population harbors intestinal parasites. The logic of their arguments is hard to ignore. Kids are basically unsanitary. Kids eat dirt, play in the dirt with other kids; wade or swim with other kids who may be unclean and may even have dirty diapers. Diaper changing at home and at day care centers can pass germs and parasites from one child to another, and to surfaces, and to adults. And it's not just today's children, we all grew up like this, having lots of potential for contracting parasites that "found a home" and stayed with us. We eat salads and raw ground-growing fruits and vegetables (carrots, strawberries, cantaloupes, and so on) that are anything but sterile. Food handlers may have "less than perfect" hygiene practices and may themselves be infected with parasites. Foods that might be contaminated, such as beef, pork and poultry, might not be properly prepared. We play kissy-face with our pets. Lots of people, including those in the armed forces, travel to undeveloped countries where sanitation is poor. There are significant numbers of immigrants from these undeveloped countries to Western countries, and a huge percentage of those people carry parasites and other intestinal infections. We repeatedly and continually come in contact with parasitic sources for our entire lives. ARE PARASITIC INFECTIONS REALLY COMMON? In a study of outpatients at the Gastroenterology Clinic in Elmhurst, N.Y., a 74% incidence of parasites was found. A total of 20% of this population harbored pathogens. One survey of public health laboratories reported that 15.6% of specimens examined contained a parasite. At Great Smokies Diagnostic Laboratory, almost 30% of specimens examined are positive for a parasite. Some of these are really ugly. 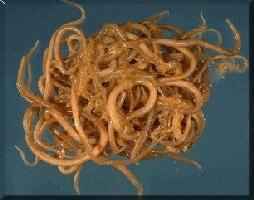 If you need an ugly fix, take a gander at these roundworms. Yuuck! Because of our constant exposure to parasites, the more progressive healthcare professionals believe it's an odds-on chance that you carry a parasitic infection. But, how would you know? Some symptoms would be obvious clues, especially diarrhea and other intestinal difficulties. But, many believe that it causes much less obvious symptoms, including conditions like Chronic Fatigue Syndrome and fibromyalgia. According to Skye Weintraub, a Naturopathic physician and author of The Parasite Menace, a parasitic infection could be manifested by any number of signs. These include constipation, diarrhea, gas and bloating, irritable bowel syndrome, joint and muscle aches and pains, anemia, allergies, skin conditions, nervousness, sleep disturbances, teeth grinding, and chronic fatigue. Many health practitioners believe not only that parasites may be responsible for a number of other health problems. Weintraub says, "Many parasites go undetected because they are not producing serious symptoms. It is easy to attribute feeling ill to other causes because parasitic infections look like lots of other conditions. I have seen other health problems disappear once the body has become parasite-free." The information provided here is just the beginning of understanding parasitic infections. Many parasites are passed through the food chain to the GI tract where they reproduce. The larvae can travel through the blood stream and settle into any organ or part of the body. Most well known is trichinosis caused by a roundworm (nematode) that is ingested from eating infected meat, especially pork. The larvae settle into the muscles where they form a cyst. Encysted larvae can remain viable for many years, and in most cases, for the life of the animal (and you). An infected swine will generally not show any clinical signs of illness unless large numbers of the parasite are present. Another example is the liver fluke, a trematode that lives in the bile ducts in the liver and infects an estimated 30 million people. It is primarily contracted from eating raw or inadequately cooked fish. The worms can live at least as long as 10 years, and possibly as long as 20 years, but they reproduce so an infection is not self-limiting and can be fatal. "Blastocystis hominis (B. hominis) & Dientamoeba fragilis (D. fragilis) are protozoan parasites capable of causing constipation and/or diarrhoea, mushy stools, stomach pain, bloating, chronic fatigue, & weight loss. They have been implicated in some cases of colitis, allergic colitis & bowel inflammation. "Surveys employing specific stool collection and testing techniques find the rate of infection is up to 50% in the general population of many western countries. Despite these findings, the type of testing necessary to detect these parasites is not routinely used in clinical practice. "Many people suffer digestive symptoms for years before diagnosis. The symptoms are often wrongly attributed to Irritable Bowel Syndrome (IBS)." HOW CAN I FIND OUT IF I HAVE PARASITES? The degree of rigor of the treatment program might depend on the degree of certainty of an infestation, so a definitive lab test is a good place to start. If you also have Candida symptoms, this is the time to also have a screening test done to determine if Candida is a factor. See our associated web page FUNGAL, YEAST, AND PARASITE LAB TESTS for tests and organizations that specialize in testing for parasites. The mainstream medical and hospital labs have a poor reputation in discovering parasitic infestations, so your medical practitioner should use a lab that specializes in digestive disorders. Several such labs are listed on the lab tests page. Any licensed medical practitioner in your state can order these tests -- licensed medical practitioners include MD's, DO's, Naturopaths, Chiropractors, nutritionists, and a spectrum of other specialties -- see our HOW TO FIND A DOCTOR page for more information. Also see our associated web page MAKING SENSE OF FUNGAL, YEAST, AND PARASITE LAB TESTS. In many cases, the treatment will be straightforward. If you do not have a complication with Candidiasis, a parasitic infection can be treated in a variety of ways that may include intestinal cleansing, herbal remedies, and prescription drugs. If you have a Candida overgrowth, then you need to treat both the Candida and parasite infections concurrently. Some people believe that their chances of having or contracting a parasitic infection are high, and therefore undertake a routine intestinal cleansing program just to eliminate parasites should there be any. These are perhaps many of the same people who believe that a periodic intestinal cleanse is a basic part of good health -- sort of a "spring cleaning" approach. Conventional (Allopathic) Medicine: If you suspect that you have a parasitic infection then you might select a doctor or healthcare provider who can order lab tests from one of the specialty labs. (Be aware, though, that your suspicions might be wrong, and the source of your problems might be something quite different, and potentially serious.) If parasites are identified, and if your doctor is an MD or DO (the only ones who can order prescription drugs), then they will no doubt write a prescription for a standard medication likely to be effective against the particular parasite. And that might be the end of it. You should know, however, that not all of the standard anti-parasitic drugs are equally effective against all parasites, and many physicians do not have the drug-parasite matrix memorized (probably almost none of them do, and that's also about how many will take the trouble to look it up). So, if the treatment isn't effective, it might mean some research is required on your part. Ask the doctor's office staff for a photocopy of the lab test results for your file -- they almost always will comply without hesitation. Once you have the name of the infecting organism you can do a targeted search on a service like Google. Google is an excellent method of exploring very narrow research topics. Search on the name of the parasite along with one or more terms such as drug, drugs, medication, sensitivity, and prescription to narrow the search results. When you find a web page from a reliable medical resource that describes the sensitivity of the organism to available drugs you are ready to make another appointment -- with that doctor, or another one. Now, however, you've got another problem -- the ego thing. Doctors aren't fond of patients thinking that they know more than the doctor about treating illnesses, so, you need to be diplomatic. Alternative Medicine: The homeopathic, natural healing approach to treatment excludes the use of prescription drugs, and instead depends on herbal remedies, colonics, fiber and mineral absorptive agents, intestinal cleansing, and so on. There is an enormous amount of medical information available on the Internet from alternative medicine sources and believers. We counted, and there are a bazillion and nine web pages about parasitic treatments. Basically, they distill down to two things: intestinal cleansing to clear out debris that might be harboring or protecting the parasites, and herbal remedies to kill the parasites. Intestinal Cleansing: There are a wide variety of intestinal cleansing programs and products. The Lemonade Diet is one such program that seems to be favored by the online Candida sufferers community; read our pages on INTESTINAL CLEANSING and MODIFIED LEMONADE DIET for more information. Herbal Remedies: There are dozens of herbal products on the market for treating parasites. They all are composites of a number of individual herbs having anti-parasitic qualities. Many of these herbs have been used for hundreds and even thousands of years to rid humans and their domesticated animals of intestinal parasites. Please see the Anti-Parasitic section in our Product Guide for information on the products we offer. Mirelman reported that allicin, the active principle of garlic extract, is an inhibitor of growth for Entamoeba histolytica. Other studies suggest its effectiveness with other parasites as well. Other reports claim that berberine, the active ingredient of goldenseal (Hydrastis), Oregon grape root (mahonia aquifolium), and Barberry (Berberis vulgaris) are effective against Entamoeba histolytica and compare favorably to Quinacrine HCl in the treatment of Giardiasis. Quassia appears to be another useful anti-helminthic, which anecdotally has been used successfully for Ascaris lumbricoides (roundworms), amoebic dysentery and giardiasis. An advantage of Quassia is its low toxicity. Veterinary Remedies: There are a number of products available over-the-counter (OTC) for treatment of animals, especially dogs, for various worm infestations. Interestingly, the medications in some of these products are the same as used in humans. (Interestingly, but not surprisingly. Other than the obvious differences, dogs are almost identical to humans biologically. This is the reason dogs are frequently used to test drugs before testing them on humans. And, almost every prescription drug for humans is also used for the treatment of dogs, including Prozac and other psycho-pharmaceuticals.) For example, OTC products include Tradewinds brand Dog Wormer which consists of praziquantel, and Happy Jack Liqui-Vict 2X which consists of pyrantel pamoate. Together, these two drugs are the standard drugs for treatment of humans for pinworms, roundworms, hookworms (pyrantel pamoate), and for tapeworms as well as intestinal, liver, lung, and blood flukes (praziquantel). Other OTC worming drugs are also available, such as Happy Jack's Tapeworm Tablets, consisting of dichlorophene. For more information, especially relating to Candida, see our page on TREATMENT PROTOCOLS. Our page on Diagnostic Lab Tests covers medical lab tests for fungus, yeast, bacteria, and parasites. Three monographs by Gastroenterologist Dr. David Bernstein provide details on ROUNDWORMS (nematodes), TAPEWORMS (cestodes), and FLUKES (trematodes), with descriptions, diagnoses, and treatments. An encyclopedic source provides a one-page overview of each of the two classes of anti-parasitic drugs: Anti-protozoal drugs, and Anthelmintics drugs (worms). A monograph from the World Health Organization (WHO) on ANTHELMINTICS describes the five basic and three additional drugs that cover the most common parasitic worm infections (note that this list includes pyrantel and praziquantel). A page from the CDC (the US Center for Disease Control) describes blood serum diagnostic procedures for intestinal parasites. Read one or more of the books from our selection of bestsellers and technical references on our page BOOKS ON PARASITES. The CDC maintains an information web site on Diagnosis of Parasitic Diseases (DPDx) at http://www.dpd.cdc.gov/DPDx/Default.htm, including information on identification, diagnostic tests, and recommended treatments. An extensive listing of symptoms that can be caused by parasites is at INVISTA.